webcamXP is a powerful webcams and network cameras monitoring, recording and streaming software for private and professional use. webcamXP PRO offers unique features and unequaled ease of use to let you manage multiple video sources on the same computer. webcamXP PRO is the ideal tool to secure your goods and keep an eye on them remotely from your phone or over internet. webcamXP PRO was added local and remote pan & tilt control. 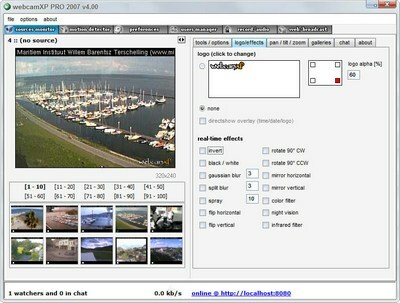 webcamXP PRO is a powerful webcams and network cameras monitoring. - Flash Video streaming (audio + video) [webcam 7] new! Qweas is providing links to webcamXP PRO 5.5.0.8 as a courtesy, and makes no representations regarding webcamXP PRO or any other applications or any information related thereto. Any questions, complaints or claims regarding this application webcamXP PRO 5.5.0.8 must be directed to the appropriate software vendor. You may click the publisher link of webcamXP PRO on the top of this page to get more details about the vendor.